A Terrible Unrest, by Philip Duke, is set 100 years ago in Colorado mining communities. A Terrible Unrest is historical fiction at its finest. Philip Duke’s novel begins at the turn of the 20th century on the island of Crete, Greece, where members of the Andrakis and Petroulakis families make the difficult choice to leave their rural homes for the United States. The novel follows these immigrants along the dirt roads of Crete to the port of Chania, where they set sail for America. Spiro Andrakis and Maria Petroulakis marry and have a daughter, Anna. They are salt-of-the-earth characters who eventually end up in the mining towns in the Trinidad and Walsenburg areas of Colorado. Through telling the story of their lives and relationships, the novel provides a detailed account of the multi-ethnic and multilingual workers who filled these communities 100 years ago. It also provides rich detail about the lives of miners and their families – from what they ate and consumed to their meager housing. The novel’s main characters face daily challenges, and it is those challenges that drive this engaging story. Miners endure low wages, dangerous working conditions, an unresponsive government and authoritarian and murderous employers. The novel’s female characters of all ages navigate a world where sexual assault and violence are a constant threat. The focus on the daily violence is no surprise since Unrest ultimately brings the reader to the Ludlow Massacre of 1914. Known as one of the most violent labor-capital struggles in the 20th century, the Ludlow Massacre resulted when striking mine workers encountered violent repression from officials of the Rockefeller empire and the state of Colorado. By the time the strike happens, the reader knows the origins of the strike and the key historical characters: Mary Harris “Mother” Jones, the Rockefellers, Colorado Gov. Elias Ammons, Colorado National Guard Gen. John Chase and union leader Louis Tikas. The novel delivers a powerful and textured account of why these workers went on strike and the emotional impact the event had on friendships, families, the union and the community. The hopes, doubts, distrust and fears of the characters provide the backdrop for well-crafted dialogue and scenes that help the reader understand the gravity of the massacre. With this novel, it is hard not to empathize with the miners in their struggle. The story builds a framework for understanding the massacre. There were two worlds of mining in the West: one of wealth and power and one of work and hardship. If miner families lived without economic security and personal safety, the owners of the mines and political and military elites experienced a world of comfort and control. From the Rockefellers and Ammons to Chase, the novel’s elites used violence protect their own economic security and to repress the union movement in southern Colorado. In this way, the novel captures well the political landscape of the past. There are other themes, too. This story is about survival and hope, about commitment and community as well as about perseverance and solidarity. The novel examines some of the larger questions about work and the realities of a global economy, then and now. It is about the rich history of Colorado. The novel also examines our relationship to place and how we understand where we are and where we came from. Ultimately, the novel helps us understand who we are and what we are (or are not) doing in our own communities. Duke, professor emeritus of the anthropology department at Fort Lewis College, is well-qualified to tell this story. While he was a professor, he spent years digging up the history of southern Colorado mining communities, and he now lives on the island of Crete. His first-hand knowledge of these parts of the world allows him to follow in the U.S. literary tradition of Theodore Dreiser, Frank Norris and Sinclair Lewis, who also wrote with great attention to the concerns and aspirations of ordinary people in historically accurate detail. For all these reasons, A Terrible Unrest makes for a great read. John Baranski is chair of the Fort Lewis College Department of History. A Terrible Unrest, by former FLC professor Philip Duke, 359 pages, Top Hat Books. 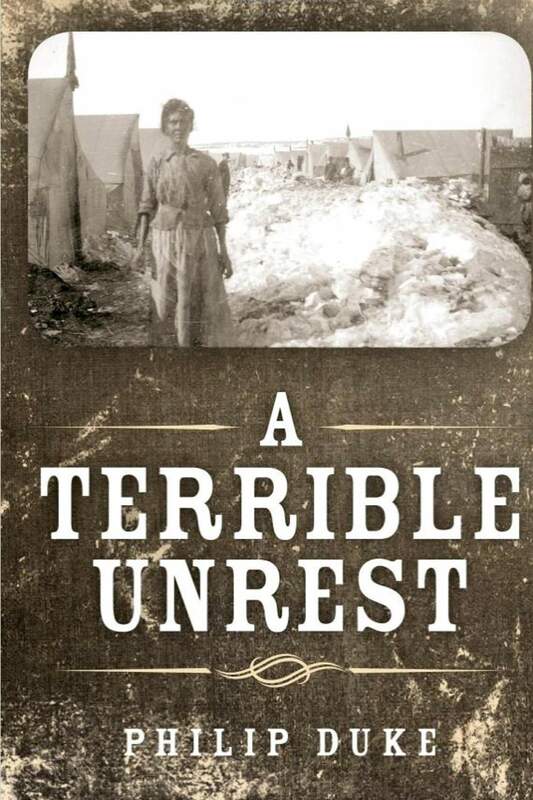 A Terrible Unrest, by Fort Lewis College professor emeritus Philip Duke, 359 pages, Top Hat Books.